In children’s literature, there are few tropes more beloved than the good-hearted child who defies a horrible guardian to reach for her or his dream. James and the Giant Peach, one of my favorite examples of this theme, is currently showing in one of its modern, musical incarnations at Young People’s Theatre. Showing again, actually, after a successful run in 2014, with a new set, new costumes, and a truly excellent new cast. More regular Toronto theatergoers will all know the frisson of pleasure that comes with reading names like Amy Lee or Bruce Dow in one’s program where one hadn’t expected to see them. Even my seven-year-old companion was excited when he realized that this Amy person I mentioned was also known to him as Jasp of the clown duo Morro & Jasp. 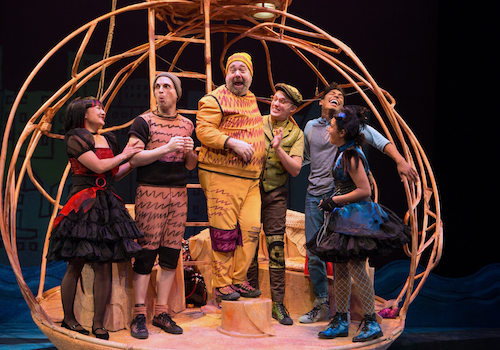 James and the Giant Peach is energetic and colorful, campy and fun. The actors are uniformly outstanding, and well-balanced between old hands and relative newcomers with great promise (especially Amaka Umeh, who gave Spiker a dimensional and nuanced awfulness, and has the scariest scary-laugh I have ever seen). The dialogue is generally snappy, and the modernized script ticks along easily, hitting the highlights of the story. I wish I felt as uncomplicatedly positive about the music, but I just don’t. Many of the songs waver as they start or drop out in the middle — they seem to have been written for a different kind of cast. This isn’t a RENT-style rock opera, and the actors are not rock soloists, but the music seems to imagine that they are. The openings of many of the songs seemed to want transposing into a more comfortable key, or some other assistance that they didn’t get. It left people with perfectly nice voices floundering as they made the transitions from speaking to singing, and I wished for musical director Jason Jestadt to do more towards support the performers he had. Costume designer Joanna Yu clearly had a lot of fun outfitting a cast of opinionated bugs and horrible aunties, and it shows. Crinolines and corsets and customized tennis shoes in vibrant colors, neoprene and satin accents, and all manner of charming touches accentuated the actors’ distinctive movement choices in delightful ways. Show times vary, see the performance calendar for details (including Family Day weekend and March Break performances). Ticket prices range from $10 to $41. Youth and Seniors pay $10 – $36.